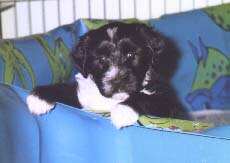 Tibetan terriers are generally healthy dogs, having relatively few genetically passed on problems. In finding the right companion, be certain that the parents are healthy. Usually the breeders will offer proof of clear breeding stock: OFA (hip dysplasia clearance and EYE clearance as well) and CERF is still used for eye clearance. OFA now also supply breeders with DNA testing for NCL, an early onset PRA, and Lens Luxation. The Animal Health Trust of the U.K. offers additional DNA tests. These DNA tests help breeders insure that your new pup will be free of these issues. There are a few other problems apparent in the breed that crop up. 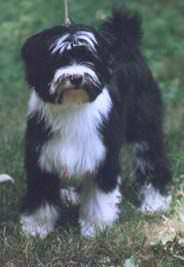 Asking appropriate questions as to the history of the breeding line and occurrences of these problems in that line will offer you much peace of mind in your Tibetan Terrier's lifetime. Are there any skin problems or allergies in the line of the puppy? Do the puppy teeth and adult teeth erupt from the gums correctly and in a timely manner, or do surgical procedures need to be conducted for proper dentition? Are there incidences of thyroid disorders and are any medications to alleviate thyroid symptoms being administerd to breedeing stock? Is there any concern of deafness? Are there other joint problems (other than hips) like patella luxation (a knee problem) in the breeding line? Are there problems with excessive aggression in the line? Tibetan Terriers are living beings. And no one can guarantee that they will go through life without minor or serious issues. So check carefully before you fall under the spell of the charming beguiling characteristics of your new Tibetan Terrier.